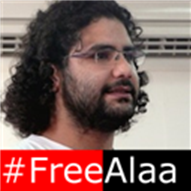 Alaa Abdel Fattah is an Egyptian blogger, software developer, and political activist. He is known for co-founding (along with his wife Manal) the Egyptian blog aggregator "Manalaa" and "Omraneya". In 2005 his blog won the Special Reporters Without Borders Award in Deutsche Welle's Best of Blogs competition.